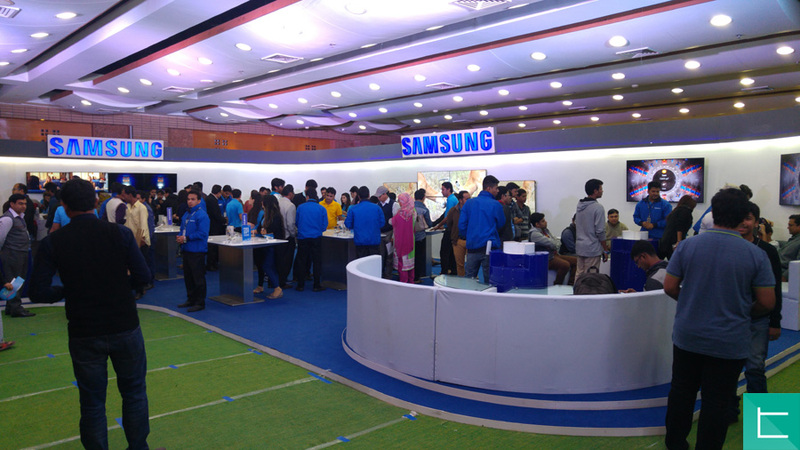 The Smartphone and Tab Expo 2016 kicked off on January 7th and we, the tech geeks of Techetron, did not want to miss such an event. The event is being held in BICC and unfortunately, as this is only a 3-day event, today is the last day. Upon reaching the venue, we managed to secure free passes into the expo by downloading Techshohor‘s app. We were ready to pay but hey, why not get a free pass instead? What did we get out of this event? Great products on display and a lot of leaflets! One of the main attractions of this event was ASUS’s Zenfone smartphones series on display. ASUS has officially launched its smartphone products in Bangladesh and this event showcased all the phones that will be entering the market soon. Although their website just listed out the products, the price was missing. We were lucky to see all the available products along with their prices. Out of all the Zenfones available there, the Zenfone 2 Deluxe looked sick! The back cover looks quite elegant and something that I would love the all the smartphones to follow as well. Samsung did not have a stall but secured a whole gigantic room for themselves. There was a VR experience booth on one side, TVs at the other and the smartphones on display at the center. We were eager to see the Galaxy Note 5 on display as advertised in the outside premises, but we saw no sign of it here. Visiting Huawei’s stall was fun, thanks to the sales man there who was determined to sell the Huawei G7 Plus by bombarding us with the device’s information and the awesomeness it possess. All the latest Huawei devices were present in the stall but the G7 Plus was the main attraction out of all them. When asked about the Huawei’s smartwatches being available here, they confirmed that it will be launching soon in Bangladesh this year. When? No confirmation there. If there was a competition of the amount of smartphones and tablets available, Symphony would certainly have won it. Symphony had at least 26 smartphones available at the expo with the Symphony ZVI and Helio S1 being the main attraction there. Elite Mobile showed off two of their new products in this stall one of which is a phone entirely in Bangla language which will definitely be a hot product! Christened the Elite Evo E40, the device costs only BDT 3,999. According to Elite Mobile, The Elite Evo E40 secures the title of being the first Bangla Android smartphone here in Bangladesh. The other phone is the Elite Evo JX1 with a massive 4,200mAh power battery carring a price of only BDT 7,222. When asked how long would the mobile last while on 3G, they assured it would last only for full 2 days. Need to test it out! There was nothing new from Goldberg’s end this year yet but had mainly the budget phones on display such as Goldberg ZAP FX1, Goldberg ion NL1 and Goldberg Eclipse EL1. Grameenphone in partnership with Intex has launched a smartwatch exclusively in this Expo and will be on sale from next month. Currently, there were accepting pre-orders for this device which carries a price tag of BDT 10,000. The smartwatch is actually a mini mobile device with the belts on. The camera is placed on the side which wasn’t working at that time as it was a prototype model. You can even insert a SIM Card in the watch which would allow you to make/receive calls. Should we actually term this device as a smartwatch? or a Mobile Device on Belts? Whatever it maybe, we are looking forward to this device hitting the markets soon! The other interesting thing in the stall was the Leap Motion game. By using the device, it was possible to control the board in any direction by just using hand gestures! This was pretty cool! All in all, the event was fantastic and we really need more of these events in the upcoming days. Visited the Expo? Let us know your experience in the comments below!